Is Your Cell Phone Killing Your Relationships? How many times have you been engaged in a conversation only to have it interrupted by a phone call or a text? Were you frustrated? Annoyed? Over the years, my wife and I have set aside 6:00 pm to 6:30 pm as “wine time”. This is supposed to be a time of focused communication between us. But it never fails. One of us will get a text and respond to it right in the middle of a conversation. We both have come to realize how rude that is to the other person and have worked at but certainly not mastered suppressing that urge to respond to texts in those situations. 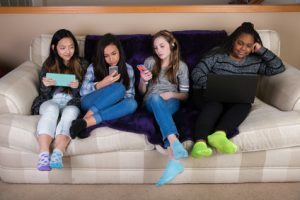 As lap tops, tablets, and cell phones have proliferated our homes have you discerned a corresponding decline in attention spans, common courtesy, patience, and basic communication skills? Smartphones, tablets, etc., are indeed wonderful, useful, and increasingly necessary in order to function in today’s world. I am glad to have them. They do make many aspects of life much easier. But they do have several down sides that subtly work against the qualities that are necessary for good relationships. Although messy, God designed our relationships for his redemptive purposes. Therefore, if our use of technology is impacting relationships negatively, we should be careful to try to correct that or avoid it altogether. What follows is not exhaustive nor based on any kind of scientific research, but rather some simple observations I have made that I offer up for your consideration. Whether or not you agree, my point is to encourage you to give some thought to how these wonderful devices may be impacting your communication and relationships and to take action as deemed necessary. They condition us to believe that we can have what we want. How many times have you yelled at your phone when Siri didn’t get your navigation right, or your voice text went through like Japanese Yiddish? We expect and even demand that our cell phones do what we want. Phones have no choice. Their purpose is to do what we ask them to do. It’s easy to get used to having our demands met. Over time, we can easily become more demanding of people and feel increasingly at ease in expressing our displeasure when people fail to meet our expectations. They condition us to not have to wait. One of the benefits of technology is speed. It is amazing how quickly we can get information and communicate with people all over the world. For example, sometimes I text with a friend while he is traveling in Asia. What took paper, ink, a ship and four months, now occurs –instantly. That is amazing progress! But relationships are stuck in a time warp. They are just as slow in developing now as they were back in any other time of human history. Relationships and speed do not go together too well. They condition us to be impatient with others. Since we usually carry our cell phones on our person, we expect immediate access and immediate responses. We grow impatient, counting the seconds while we wait for a reply. Just think about how many times we pick up our phones after sending a text looking to see if it was read or if there is a response! It is easy to become impatient in other ways when people don’t respond to us according to our expectations. They set us up for misunderstandings. Long and tenuous but necessary conversations can seem completely unrealistic. Like trying to fit a size 9 foot into a size 5 shoe, we try to force what should be important communication into a series of texts. As a result, we miss important context as well as the visual and auditory parts of communication from which we derive as much as 80% of the meaning. The “ok” response to a text asking that we “stop by Walmart to pick up some potatoes” for dinner could be read as, “Ok! Glad to do it!” Or, it could be read as “I don’t want to stop. I am frustrated about having to do this, but I’ll do it”. Which is it? Hard to tell. But as is often the case, we tend to think the worst and allow that judgement to influence our interaction with the person. A delayed response can tempt us to think someone is angry and avoiding us when in fact they are not. We can easily misunderstand, make wrong judgments and then mistreat the other person based on those judgments. They condition us to be subject to the tyranny of the urgent. We can become driven by tyranny rather than priorities. Often, but not always, what is important is not urgent. We can be so busy with the perceived urgency of texting, checking facebook, tagging, liking, posting, and tinkering that we lose sight of what is important. We’re quickly arrested by the merry melodies of our phones while fading in and out of important conversations or avoiding them altogether. Becoming more unusual is the fully engaged, complete conversation where we look into the face of the other person. Following are a few guidelines, some of which we have found helpful. Some reflect what others have found helpful. Lord willing, they may prime your own pump for what you and your family can do if this is a challenge for you as it is has been for us. -Work to set some sort of parameters about how you handle texts and calls. Do you answer them immediately? Or do you wait some period of time before reading and then answering them? It is good to let people know your “policy” so that they can adjust their expectations. Our life is not in our connectivity. None of us are so important that we have to be available 24/7/365. The simple truth that we have all we need in Jesus Christ is comforting. Do we find full satisfaction in Him so that we are less tempted to find it in our connectivity? That daily reminder can help us keep our cell phones from killing our relationships. Was this helpful to you? Please forward it to a friend!